Villa Marina Hotel is a traveller’s delight, located at 1B, Marina Avenue Opposite Mobil Housing Estate, Eket Akwa Ibom. This 3-Star luxury hotel belongs to a class of its own given the elegance of its structure and the serenity of its location. Villa Marina Hotel has a total of 127 rooms of varying categories including Single, Standard, Deluxe and Luxury Suites with each exuding first class comfort owed to the posh designs and lavish furnishings. 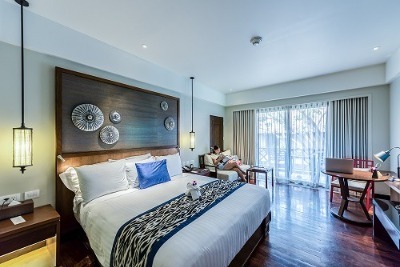 All rooms are equipped with digital card door keys, comfortable beds, air conditioners, flat screen TV, private safes, a refrigerator and en-suite bathrooms fitted with showers and bathtubs. Facilities available at this hotel include an outdoor swimming pool, restaurant, an exclusive main bar and Wi-Fi connectivity. Event halls well-equipped with modern multimedia facilities are also available at affordable rates. Guests can also attend to their personal grooming at the body clinic where facial treatment, massage, manicure and pedicure would be handled by well-trained beauticians and masseurs. Several value-added services are also available on request. These include laundry and dry cleaning services, storage room service, car hire service and room service. A: No. It doesn't provide such services. Q: Does Villa Marina Hotel charge for internet access? A: Wi-Fi internet connectivity is free for all checked-in guests. Q: Does Villa Marina Hotel have on-site parking for guests? A: Yes, there is ample parking space for guests and it is absolutely free. Q: Does Villa Marina Hotel offer airport pickup services? A: No. It doesn't offer such services. Q: Can I cancel my booking at the hotel? Is it free? A: Yes, cancellations are free up to 1 day before arrival. Villa Marina Hotel is a budget hotel in Eket, Akwa Ibom. I stayed in this hotel on a business trip and I enjoyed my stay throughout my visit. Excellent service, well groomed and experienced staff and the food was divine. We stayed in this hotel and everything went well. The staff were young, energetic and always at your service. I really appreciated the services provided by the hotel; it was up to the standard and above my expectation. The hotel is a very nice place to be, the only problem is just a portion of the staff who were inefficient. The bar attendant was rude and incompetent. But the receptionist was friendly and well mannered. The room I stayed was comfortable and well decorated. The meals served at the hotel were quite expensive. I stayed at the hotel and it was okay, the room was clean and comfortable.The environment was clean, my bathroom was clean too. The room service was perfect. Have nice pictures of Villa Marina Hotel?